Side Canopy: 170.6cm (Can be built at either side so effectively as viewed in a mirror. **Are supplied with the building but need to be cut in during assembly. The point of this is to allow the column winodws and the doors to be positioned to suit the garden / requirements. Please contact us to discuss how to cut in - it is a simple process but has to be done correctly. Norland Claypole Room Log Cabin: The Norland Claypole Log Cabin offers a large covered area with a canopy to the front and side. the building can be mirrored meaning that the whole building is effectively as seen in a mirror. The building features a main room with a Large Fixed Window and Two Opening Column Windows for additional light and ventilation making a lovely airy summer room that can be used throughout the year. The covered area offers a perfect covered storage area or an outdoor area for leisure with shelter from rain and sun. The cabin room is large enough for office furniture or a bed or sofa set. This log cabin has 44mm thick wall logs and is fully double glazed. 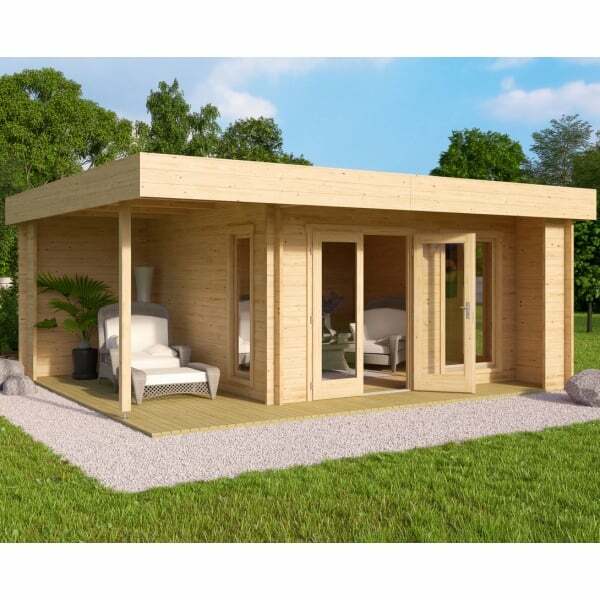 This generously sized garden office style building comes with full assembly instructions and plans included. There are no screws or nails required in the construction of the walls due to the interlocking wall log design. If you are looking to create a retreat in the garden away from the main house with a ridge height that is less than 2.5m then this is the perfect building for you.